Post Office Square's highly successful park was built on the site of a parking garage. The garage was moved underground. Commonwealth Avenue: Back Bay's elegant boulevard is one of the city's most successful streets. Piers Park: Successful in large part because of the designer's sensitivity to the requests of the East Boston community. South Boston Marine Park: This not-yet-completed park recognizes that open space alone is not enough to attract people. Parc de Clot: Interesting reuse of an old industrial site on a scale similar to many Central Artery parcels. Porta Vell: A mostly successful project that reconnected a port city with its waterfront. The Ramblas: An outstanding example of a main thoroughfare with a people-friendly scale. Parc Andre Citroen: Reuse of a huge industrial complex to create a park that is an urban work of art. Viaduc des Arts/Promenade Plantee: Innovative reuse of an old elevated railroad viaduc to create a much-needed urban park. Crissy Field: An obsolete military base was redeveloped into a vast and successful public open space. Ferry Building Plaza: A not-altogether-successful attempt to redevelop the land formerly occupied by an elevated downtown expressway. Rincon Park: Public-private partnership use to build and maintain a waterfront public park. Yerba Buena: This combination of park and civic space is a testimonial to the power of careful urban planning and careful event planning. 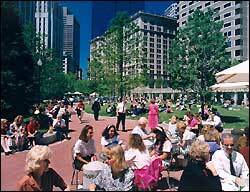 Norman B. Leventhal Park at Post Office Square, constructed in 1991, is among the best-loved public open space in Boston. During a spring lunch-break it is difficult to find a place to sit or even stroll through the park because of its popularity. The park occupies 1.7 acres. It is the size of the Big Dig's Parcel 19, located next to the Edison site at the new Northern Avenue Bridge. Bracketed by the Boston Financial District's two main streets, Congress and Pearl, Post Office Square provides open-space contrast to the dense concentration of Class-A office buildings that surround it. The park is open to the public, but is privately owned and controlled by the Friends of Post Office Square Trust. The park sits atop a 1,500-car parking garage, which provides part of the revenue to maintain and operate it. The trust also collects assessments from the owners of adjacent buildings. Post Office Square is maintained to high standards, with a maintenance budget of $3 per square foot. The Halvorson Company was the landscape architect and designer; Skidmore, Owings & Merrill of New York was the master planner; Ellenzweig Associates, Inc. was the architect of the restaurant structure. Parsons Brinckerhoff Quade & Douglas, Inc., were the civil engineers; CMS Collaborative consulted on design of the fountain. J.F. White Contracting Co. was the general contractor; Eastern Irrigation Company provided the irrigation; Schumacher Landscaping Inc. was the landscape contractor. Post Office Square was designed as the front yard to a group of Boston's most prestigious Class-A office towers. It reclaimed land from a dilapidated above-ground parking garage that was a blight on the district. The garage was relocated below ground, under the park. Post Office Square is a park for all seasons, containing more than 125 species of plants and an extensive lawn. Bushes, plants and flowers edge sidewalks. A dense a canopy of large trees protects the park, providing shade in the summer and filtering the light in the winter. The ground cover, shrubs and trees define and reinforce sidewalks, fountains, art, and a restaurant featuring a gamut of building materials -- brick, stone, wood, metal and glass. Building the park on top of the underground parking was made possible by a 54-inch-deep layer of soil and drainage material, allowing the location of the plants and trees on the surface. The park encourages activities such as eating, reading, and people watching. Additionally, the park is designed to hold performances and accommodate supervised day care visits by children. The café boosts activity and helps extend the active hours of the park. On-site services include an information kiosk, seasonal displays, and a flower stall. The park's centerpiece is an all-season restaurant that includes 100 outside moveable chairs. Shrubs, trees, and ground cover define a series of garden rooms offering the visitor a variety of experiences, including a Red Oak tree and two giant Watern Arborvitaes. Ramp access to the underground garage brackets the park on Congress and Pearl streets, successfully masked by flowers, shrubs and trees. A kiosk structure, fountains, and art provide points of interest in the park. The Friends of Post Office Square Trust is the owner and operator of the park, offering programmatic direction and guaranteeing excellence in design. The occupants of every car parked in the garage must traverse the park, ensuring constant activity and maintaining security. The public/private partnership that operates the park demonstrates that commercial interests and the civic values of public realm open space can coexist. These case studies were researched and written by Zhan Guo and Alex-Ricardo Jimenez of MIT, under the direction of Thomas J. Piper of the Department of Urban Studies and Planning. They examine a series of urban open space projects with particular lessons for Boston as it decides the future of the land freed up when the Central Artery moves underground.